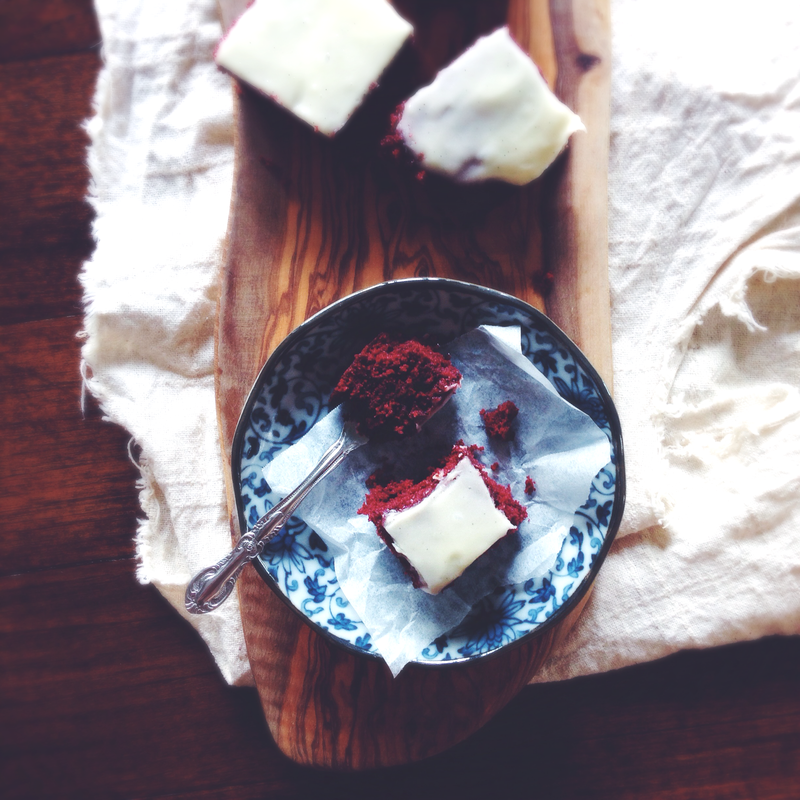 The most moist, fluffy and tender red velvet cake bars your lips will ever meet. Cream cheese frosting. That is all. Thick, creamy, vanilla bean-ified frosting. Red velvet has gotten quite a bit of flak recently. Most everyone has tried these dainty red cakes slathered in cream cheese frosting. However, due to its perceived nature of artificiality and lack of distinct flavour thanks to too many a sticky-topped, mass-produced factory version, people have come to believe the one true hero of the eponymous red velvet is really just that cream cheese frosting… and not much else. If I may quote someone from my favourite TV series– red velvet is a lie! The chocolate notes have been forgotten, abandoned, and what was once known (I remember the trend hitting hard around 2-3 years ago) for unbeatable moistness and tenderness has been passed off as that unnecessary trendy thing with too much red food dye. With this recipe, hopes have been revived. I found it in my mother’s huge collection of cake recipes (quite literally a huge grey file labelled ‘CAKES’), and modified it to taste and texture. The red velvet batter has the perfect hint of chocolate, and the cream cheese frosting is rich, cram-jammed with real vanilla bean and the right amount of tang. I could go on about this cake and how easy it is, but I don’t think I need to bore you with the details. Let’s get to it, because life is short and there’s no point wasting time wasting time. Preheat your oven to 180C (350F) and grease and line your cake pans, be it 8×8-inch square baking pan(s) or 3 6-inch round cake pans. Melt your chopped plain chocolate in the microwave and set aside for the time being. Take your cream cheese out from the fridge so it has time to come to room temperature. If you’re making your buttermilk (because you’re like me and can’t be bothered to run to the grocery store just to buy that packet of buttermilk), mix together the whole milk and white vinegar in a bowl and set aside as well. In a large bowl and with an electrical whisk or Kitchenaid if you have one, beat together the softened, unsalted butter and white castor sugar. Beat until pale and fluffy, at least 30 seconds or so. Add the eggs one at a time and beat between each addition. Add the vanilla bean paste at this point, and then sieve in the cocoa powder. When sieving, I find it handy to place your bowl on a weighing scale and then sieving in the cocoa powder until you reach the 50g mark. 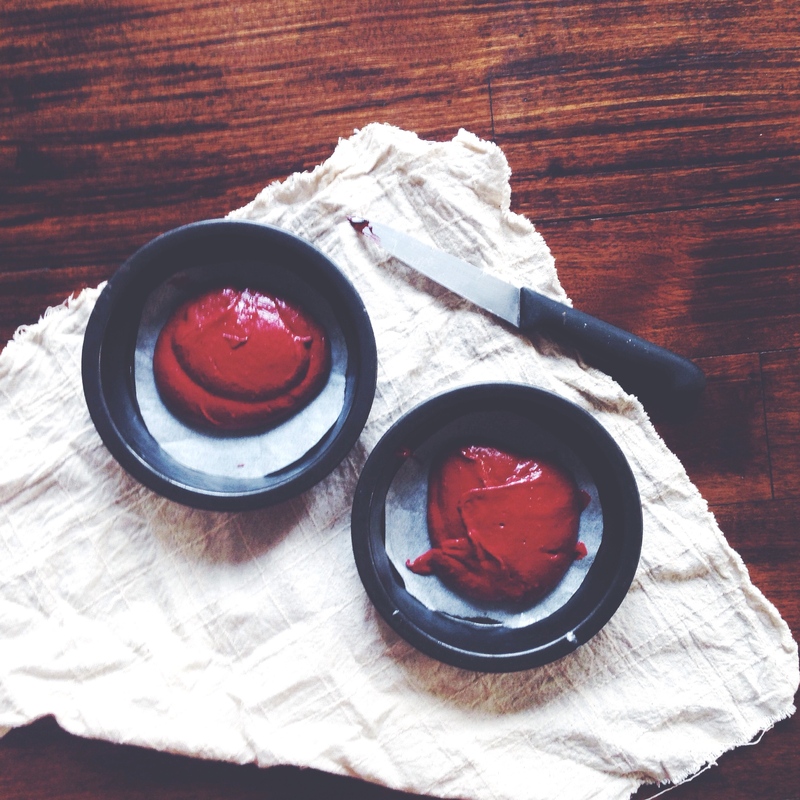 Beat the vanilla bean paste, cocoa powder and your melted chocolate on a low speed until it’s all combined. You should have a thick, sticky, dark batter. At this point, add your red gel food colouring. I used a heaped tablespoon, but you may want more or less depending on colour preference. Start with a teaspoonful of food colouring and then work from there. I find that a heaped tablespoon (I used a ‘Christmas Red’ hue) does the trick, producing a rich, deep, carnation red, nothing too pink or too dark. In a separate, smaller bowl, whisk together the flour, salt and half a teaspoon (it’s part of the amount stated in the ingredients list above) of fine salt. This is the dry mix. Add half of this to the chocolate-butter mix you just put together, then add half of the buttermilk. Beat on low speed briefly, then add the rest of the flour and the rest of the buttermilk. Using a spatula, scrape down the sides and make sure all the batter is evenly mixed, folding from the bottom and coming up through the sides and middle. Now for the kinda magical bit, and what gives the batter a final kick and ridiculous level of moisture! In a small saucer, mix together the remaining 1 tsp of baking (bicarb) soda and 2 tsp of white vinegar. The mixture will fizz up. Immediately tip it into the batter and mix in thoroughly with a wooden spoon. Pour the batter into your cake pans and bake in the preheated oven for 20-22 minutes. If you’re using 6-inch cake pans, check at the 20-minute mark– insert a wooden skewer into the middle of the cakes; if they emerge with wet red batter then bake for 5 more minutes. With an 8×8-inch cake pan, these will be done by 20 minutes, but every oven is different, and they may take 2 minutes more or less. While the cakes are baking, make the cream cheese frosting. In a large bowl and with an electrical whisk, beat together your soft, unsalted butter and cream cheese. Then, beat in the vanilla bean paste, icing sugar and salt. Once the cakes are baked, leave to cool on cooling racks for at least half an hour before removing from the pans and cutting off the tops (the cutting off part is unnecessary if you’re baking these in an 8×8-inch cake pan). If you’re using the square baking pan, spread on the cream cheese frosting, then cut into bars. If you are using 3 6-inch cake pans, spread on a large dollop of cream cheese frosting on one layer, then stack with the second layer, and repeat. If you’re making a cake this way and you’re done with the last layer, immediately let the cake set in the fridge, for the cream cheese frosting will start to melt all over the place otherwise. With the amounts stated above, I could make a stacked 2-tier cake and one 8×8-inch square cake (with lots of leftover cake from the tops!). These cakes can be stored in the fridge in an airtight container for up to a week. I’ve never tried red velvet, but I’ve always thought it looked really good. Then I watched OITNB. Haha. I want to make these!